A programmable logic controller (PLC) is a specialized type of computer designed for applications requiring high reliability, ease of programming and sophisticated fault diagnosis. PLCs are commonly used in manufacturing processes, especially robotic devices on assembly lines. A PLC’s design must be validated before it can be used. This process consists of three phases, which include defining the functions that the PLC must perform, building a PLC that performs those functions and proving the PLC behaves as intended. PLC validation often relies on OPC Unified Architecture (UA), which is the latest OPC technology. OPC UA overcomes the limitations of OPC Classic to increase productivity, improve quality and lower costs. Visual Components provides an interface for OPC UA that allows users to perform PLC validation by connecting a simulation to external controllers. Visual Components provides an interface for OPC UA that allows users to perform PLC validation by connecting a simulation to external controllers. OPC UA is a machine-to-machine communication protocol for industrial automation. It was developed by the OPC Foundation, which currently has over 35 collaborations. Key industries using this protocol include manufacturing, pharmaceutical, industrial robotics, building automation and oil & gas. OPC UA is platform independent, meaning that it doesn’t require a particular operating system or programming language. Furthermore, OPC UA has an open source, so it can be used without fees or restrictions. OPC UA allows industrial equipment and systems to communicate with each other, generally for the purposes of control and data collection. It uses an integral information model, meaning that an organization can model its data into a namespace to take advantage of OPC UA’s service-oriented architecture (SOA). OPC UA also has sophisticated security that authenticates clients and servers to ensure the integrity of their communications. PLC validation is a legal requirement in some industries such as drug manufacture, where product quality is particularly important. It requires extensive documentation, including procedures, test data, summary reports and certification forms. This documentation provides users with a high degree of confidence that a PLC will consistently provide control information or data that meets predetermined specifications. Validation is especially beneficial for machines that use software, which is constantly changing to meet the complex needs of its users. The ability to show that a PLC is behaving as intended is also a sound business practice. 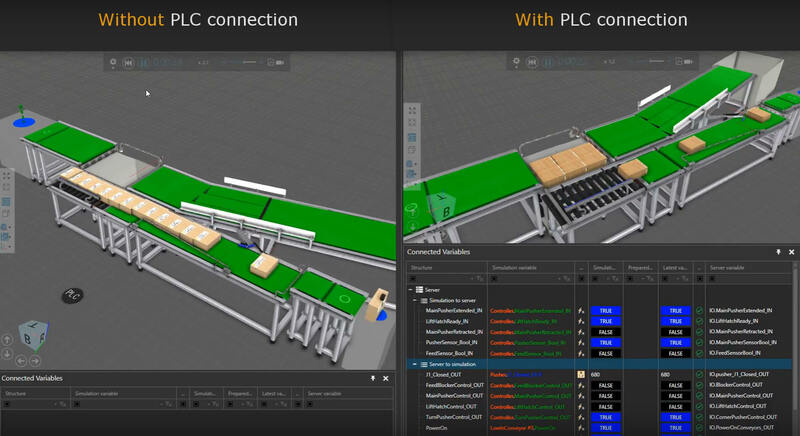 Visual Components 4.0 allows you to connect a remote OPC UA server and PLC to a 3D simulation. Start the PLC program on a virtual machine (VM). Turn on the connectivity feature in Visual Components and restart Visual Components. Create and configure an OPC UA server in Visual Components. Connect that server to the VM running the PLC program using the VM’s IP address and port number. 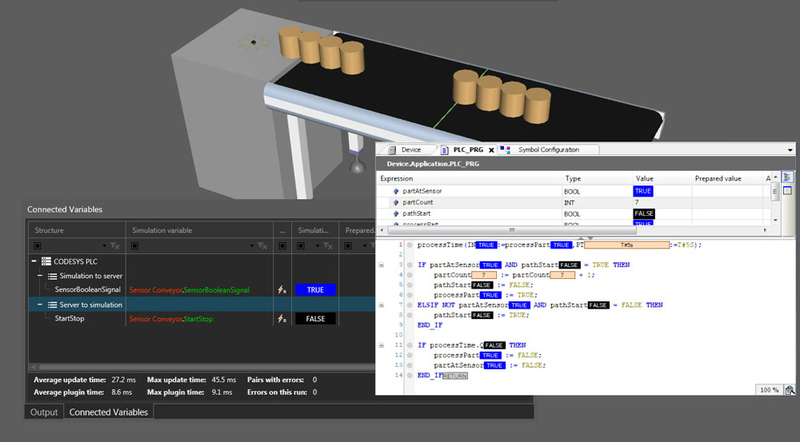 Build a layout in the 3D world and use that layout to map variables in the server to variables in the simulation. This process allows the PLC program to control the simulation by performing actions on the parts as they move along a conveyor belt. The simulation’s behavior can be controlled by turning variables on and off while the simulation is in progress. You can watch this video for step by step instructions on how to do it yourself. Interested in learning more about how you can validate PLCs with Visual Components? Contact us for more information and to get a free web demonstration. Take a quick tour of the Visual Components library, the eCatalog! We’re excited to introduce Visual Components Experience, a new way to experience manufacturing design and simulation.